Communities, at their core, are about relationships. In order to promote and build an equitable society, we have to practice equity-based community engagement where historically oppressed or ignored community members have authorship over their lives and future. But what if our institution has historically been the oppressor or has broken trust with the community through planning, programming or funding practices in the past? 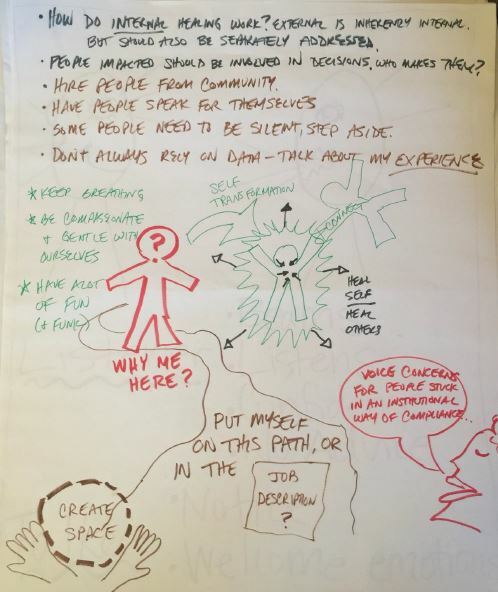 How can we rebuild trust and begin to heal the relationship with community? 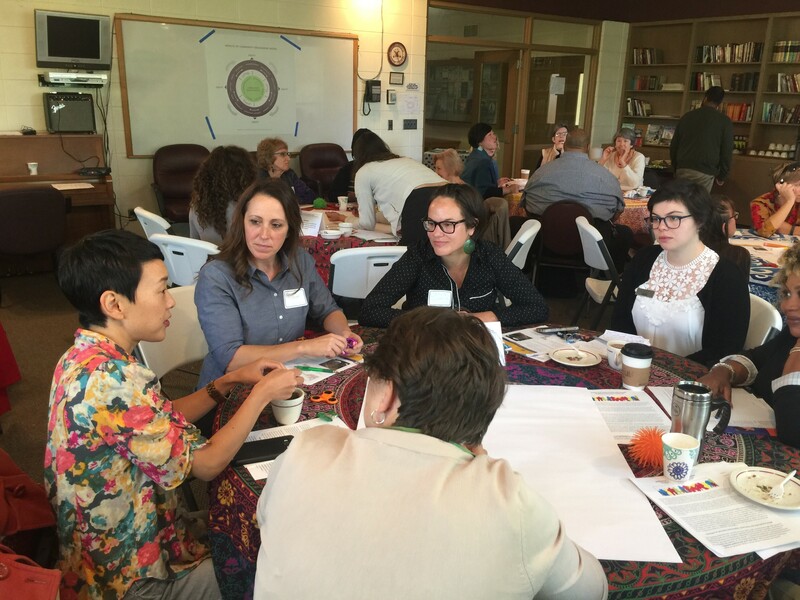 incorporating relationship-centered practices in community to repair trust. In order to practice authentic community engagement, we have to first confront our own personal experiences with historical trauma, microaggressions, and toxic stress to move toward self-healing and self-care. Practices such as meditating, taking breaks, having fun, and walking in nature are all important during the work day (and on the clock). “I try to have feelings at least once a day, I do acupuncture once a month, and I do poetry with a group of fellow Arabs,” said panelist Jna Shelomith of Ramsey County. Taking care of ourselves and creating space for self-care allows us to release toxic energy from our bodies. In turn, space is created for communities’ energies, emotions, and healing. Dominant workplace culture encourages the separation of home and work life, but why? We are all part of a community – and that does not stop when we walk into an office. We should make time at work to be our full selves – incorporating time to show emotions, sharing what’s going on in our lives, listening time at meetings, and bringing healing components into staff trainings. “Having more authentic conversations, even though they bring up thoughts and feelings that can be hard to hear or challenging to have, are a sign of success. Sometimes organizations are confused by this turn of events. Organizations assume that if no one’s talking about these issues, then everything is going fine. Quite the contrary–if you create enough safety, more and more conversations will happen, and more issues will come into the light; the silences are to be broken. And that is a good thing.” (Luna Jimenez 2015). In addition to creating a workplace that values listening and relationship-building among staff, having internal support groups and caucuses can be a safe space for people to release toxic energy, as well as hold each other accountable. “For the Giving Project, we had a POC [people of color] caucus and a white caucus, because there’s different healing and different spaces that we need,” said panelist Caitlin Schwartz, board member for Headwaters Foundation for Justice. Identity caucuses are a powerful way for us to learn about ourselves – as both the oppressor and the oppressed – and allow space to process our patterns of behavior as well as to heal from the actions of others. As the saying goes: “Show me your budget and I’ll tell you your values.” Prioritizing community engagement, community healing, and organizational healing requires a budget line item (or multiple line items) for relationship-building and personal wellness. Are we providing resources for employees to take care of themselves and their families? How are we investing time to repair trust with community and get on the path to healing? 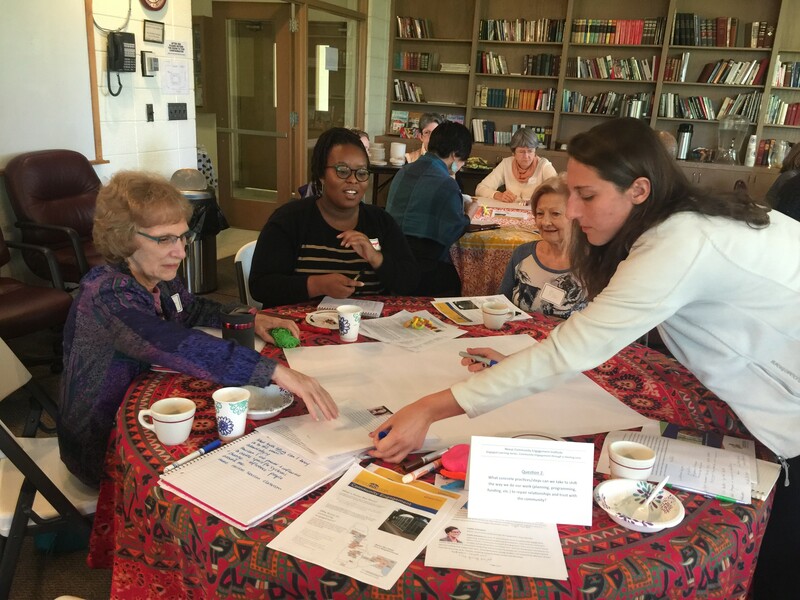 What financial resources are we investing for community to be nourished and to heal? Additionally, who are we hiring and how are we investing in the community? 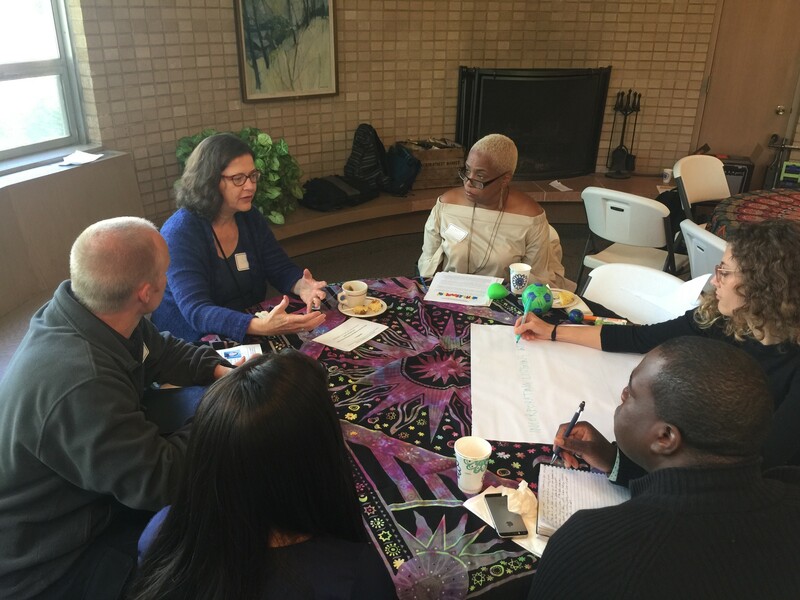 Part of the path to healing is about institutions’ accountability to community, which includes honoring the community’s knowledge and assets by providing paid opportunities for community members to lead at institutions. Caitlin Schwartz elaborated on the work of the Giving Project. “The Giving Project was created by having a group of community members determine the criteria for funding, and then actually being responsible for granting those funds to local organizations.” We all need to take a look at our grantmaking, hiring, and other internal processes through an equity lens to see who benefits from our work and who is burdened by our work. 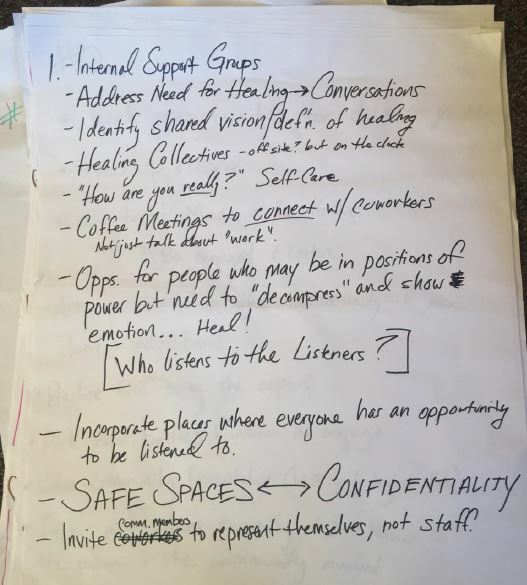 In addition to the above internal shifts, healing between institutions and communities requires representatives of those institutions showing up as listeners — honoring the community’s wisdom, knowing the history and context, and being prepared to be uncomfortable, transparent, follow-through on promises, and open doors for community leaders to lead. Self-awareness helps us build more authentic relationships, and helps us to realize when we should give up or reclaim power. Sometimes giving up power means partnering with community organizations that do have the community’s trust and investing in their work. JooHee Pomplun told a story about Cambodian refugees who didn’t feel settled or at home in Minnesota. After experiencing the Little Mekong Night Market, an amazing opportunity to experience the sights, smells, sounds, and tastes of traditional Southeast Asian night markets, Southeast Asian elders told JooHee that for the first time, this felt like home. The Little Mekong Night Market was co-developed with the Asian Economic Development Association as a result of their community engagement efforts. Community engagement can lead to some incredible outcomes – not the least of which is healing, for individuals and for our communities. “My somatic healer friends have told me that the lungs actually lie in your back, so when we say ‘I’ve got your back’, I picture holding your lungs so we can breathe,” said Jna Shelomith. This is about changing how we do our work and how we have the community’s back. The pathways to healing are complex, but we can move systems together – and it starts and ends with relationships.